With war’s end, suffrage advocates stepped up their campaign for equal rights and finally saw Congress pass the 19th Amendment giving women the right to vote. 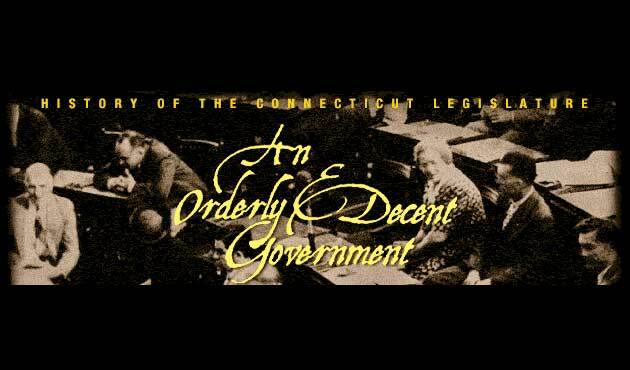 Fearing that 200,000 new voters would disrupt Republican control, J. Henry Roraback urged Connecticut’s Congressional delegation not to support the amendment and rejected all calls for a special session of the General Assembly to ratify it. Only after the necessary 36 states had already approved the amendment did Connecticut act. Despite his antagonism to suffrage, once women won the right to vote, Roraback sought to add them to the Republican electoral base. In 1920, three Republican women won election to the House along with one Democrat and an Independent. Four years later, Republican Alice Merritt became the first female state senator. Roraback ignored minority Democrats in the legislature. Important committee assignments went to his trusted small-town allies. 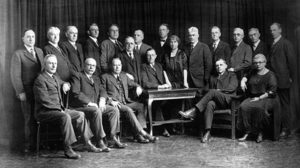 The entire 1925 Appropriations Committee was made up of Republicans and included no representatives from the state’s five largest cities. From his offices on the third floor of Hartford’s Allyn House Hotel, Roraback controlled executive and judicial appointments, nominations for higher office, state appropriations and other actions of the legislature. The Roraback machine reached its peak in the election of 1926, virtually driving the Democrats from the Senate and establishing an overwhelming Republican majority in the House.